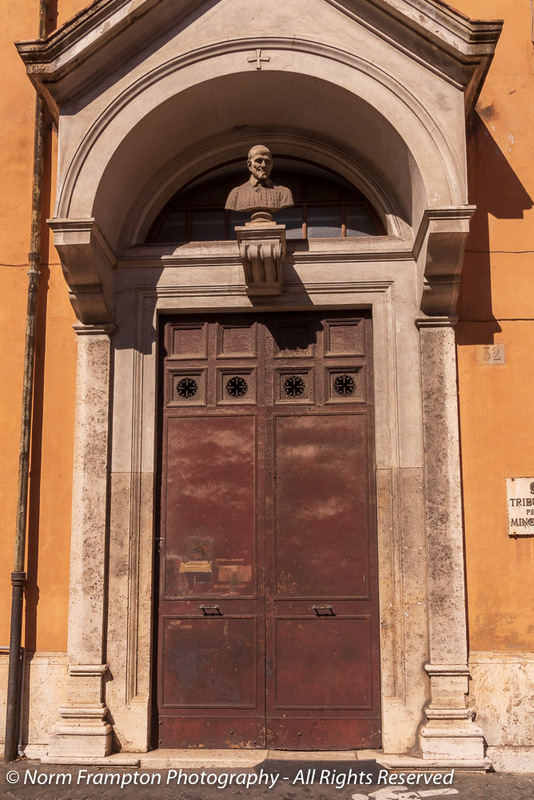 Continuing on our walking tour around Rome this week, here’s another collections of interesting specimens. 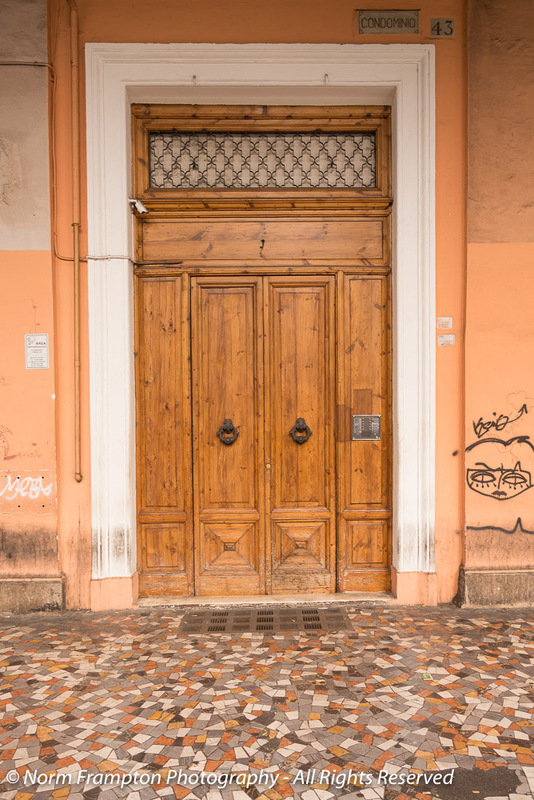 And in case you missed the previous installments, you can check out all of the beautiful doors I found in part 1 here and in part 2 here. I love the color of this one. Ooh good a corner door! Even better, a curved corner door! They can’t all be pretty in the traditional sense. So which one(s) did you like best? I had a good Thanksgiving even though I had a cold. I feel better now. I love the doors. I love the curved one. As always, a great collection Norm! #21 was very interesting. I loved that blue door! It’s placement in white stone really set it off. There’s also something intriguing about the rounded entry door. More incredible doors. I tried to pick my favorite but couldn’t! 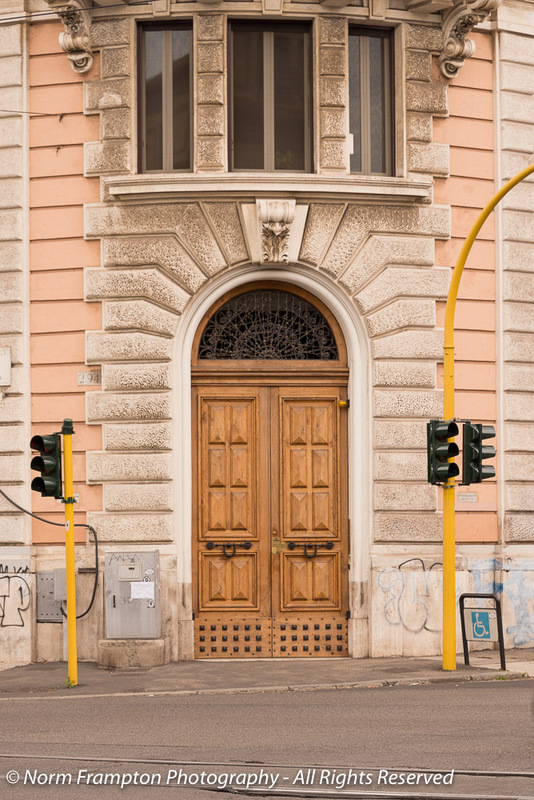 I do like the “rounded” door on the corner and the first door with the top. But, wow, so many beautiful ones. 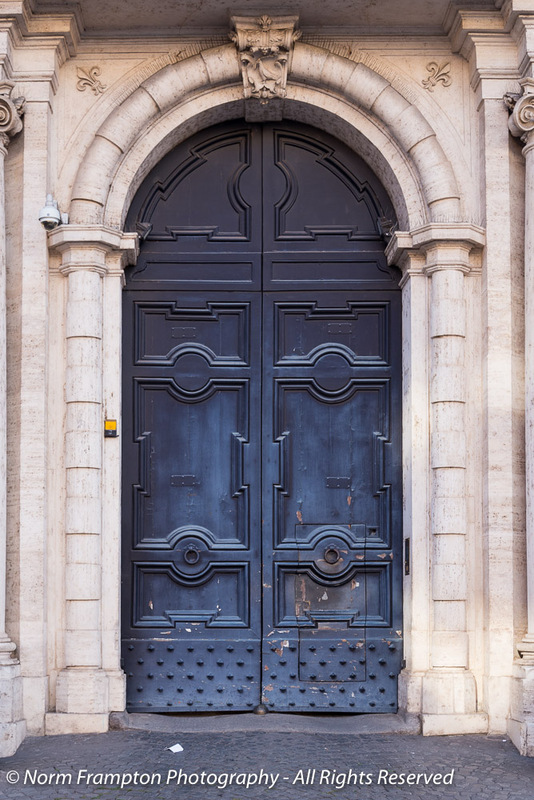 Loved these doors, especially the arched radius door. Fabulous. here are a few distant doors from me. 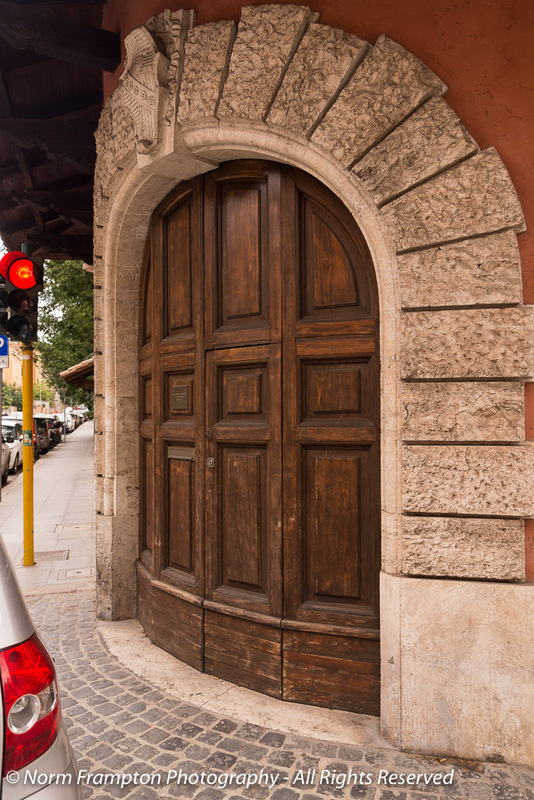 The curved doors must be a challenge to make, but it’s even more telling that they survive so well. Yes, this one was very well maintained. Lovely doors. Except the one with the graffiti. Another wonderful set. I like the one with the traffic lights. I wonder how you got so many doors without cars or motorbikes parked outside. Most were shot in close, but there were a few that I wanted but could not get because of obstructions. Amazing, again! Love that green, especially the studded bottom. I AM. SO MUCH! 😀 Thanks! We did lots of walking which made it easier to find doors but yes, we visited so many places and probably stopped into 12-15 old churches and cathedrals alone. Thank you Alice. The curved one was my favourite but it was difficult to get a good shot. There’s a human being in one of your shots! I hope you’re staying warm up there in Canada…. Keeping warm but it looks like it’s going to be a long winter. 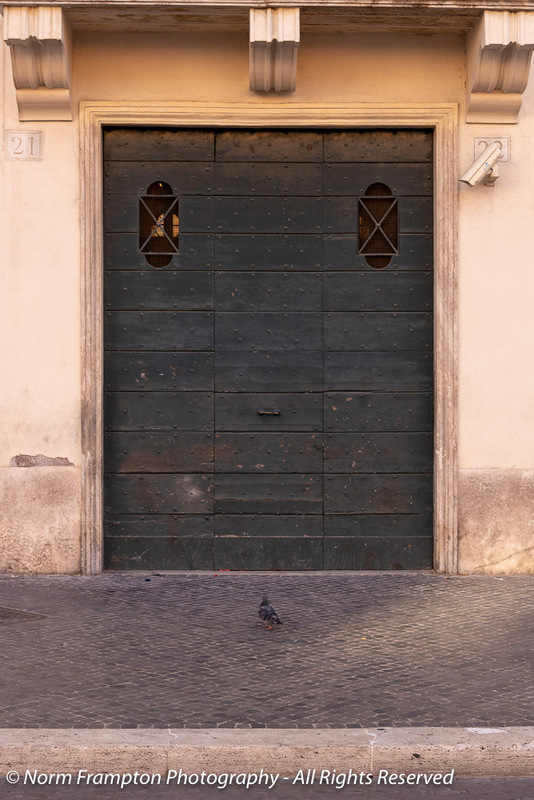 You take such beautiful door pictures… and mine today is goofy again…. So many fabulous doors, Norm. It’s a good job Thursday Doors wasn’t about when I was in Rome with my sisters. I would have driven them mad trying to take even more photos than I did. Magnificent doors, Norm. 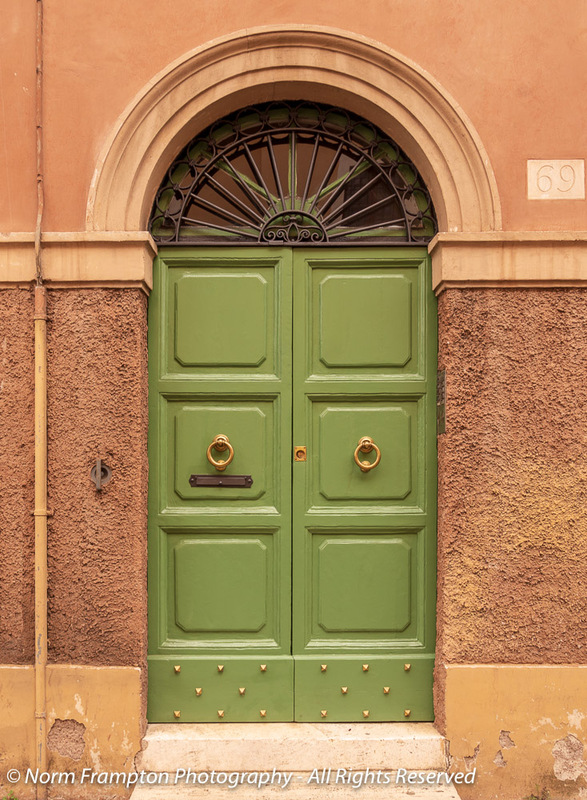 The green door with the iron work on the fan light, and the curved door with surrounding curved stone work are my faves. Thank you for three weeks of this door collection. 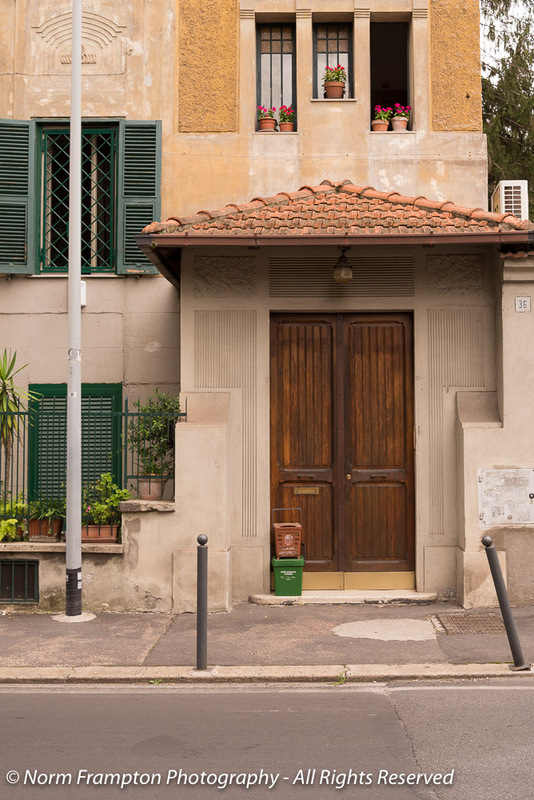 Lovely collection of Roma doors. My favorite is the deep blue one. Not a color you see very often. Thank you. Yes I thought the colour on that one was quite unique. Your fabulous doors make a nice Thanksgiving present. Happy Thanksgiving to you and yours. Love Thursday Doors! Thanks Linda. That curved one was certainly one of my faves from the entire trip. Wonderful doors, Norm! The curved door and stone arch is my fave. 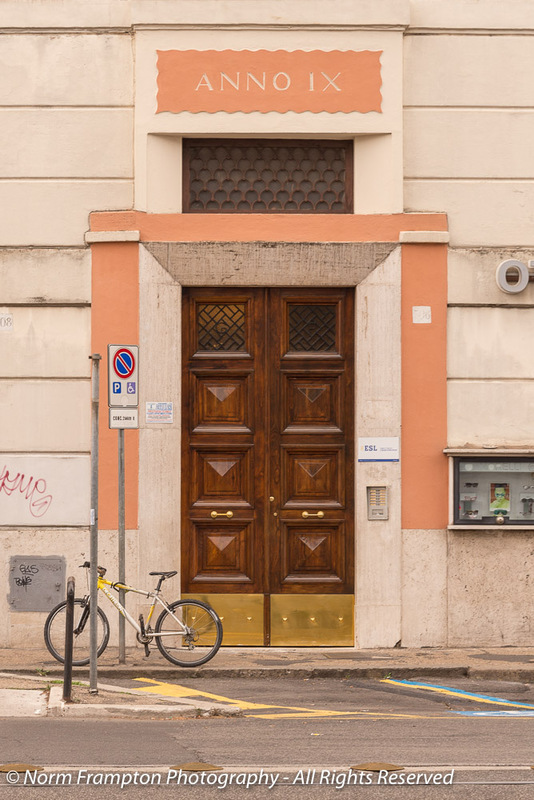 I will have to head over to Rome doors #1 and #2 to see the other lovely specimens from your trip, although I’ve been catching some here and there on Instagram. 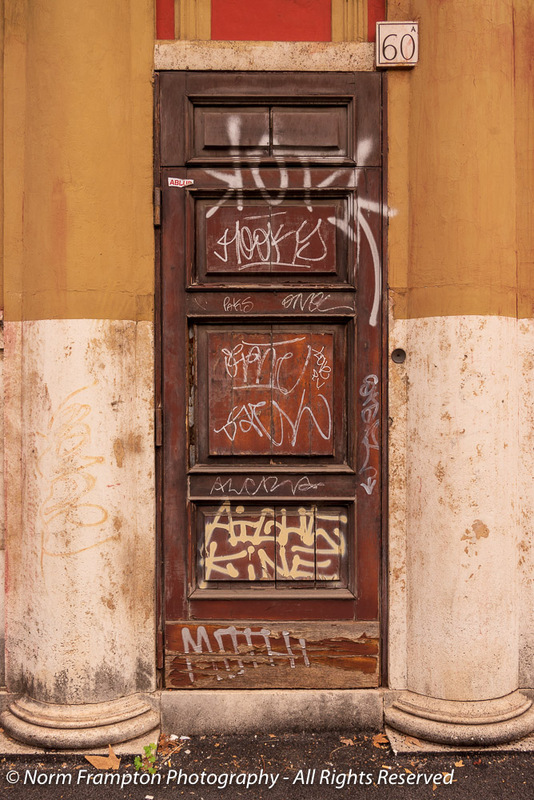 I can hardly imagine what a beautiful and intriguing city Rome is for doors and many other reasons. Yes, I’m making a guest appearance today. A holiday allows me the privilege of hanging out with everyone. Happy Thursday to you and please have a piece of pie in honor of our Thanksgiving. Thanks for dropping in. It’s nice to see you. 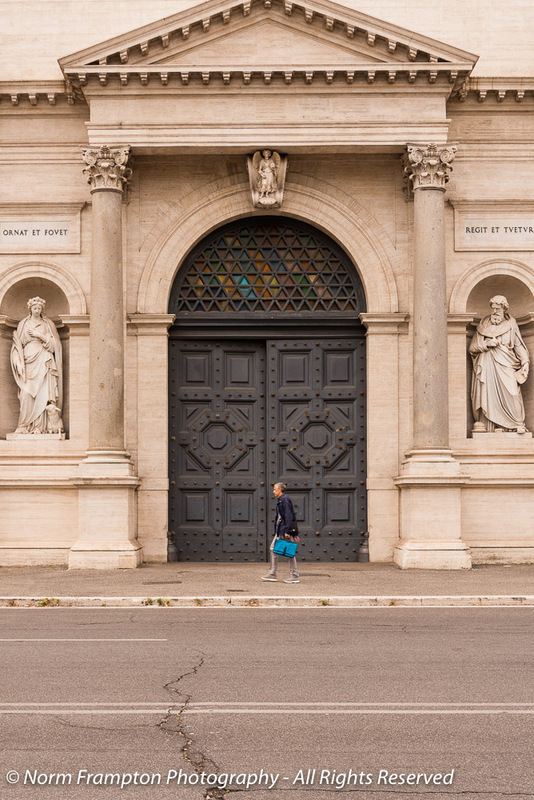 I like the doors, huge, with the man walking in front of them, while the statues of elders, huge, stare down on the man. There’s something poetic about that photo. 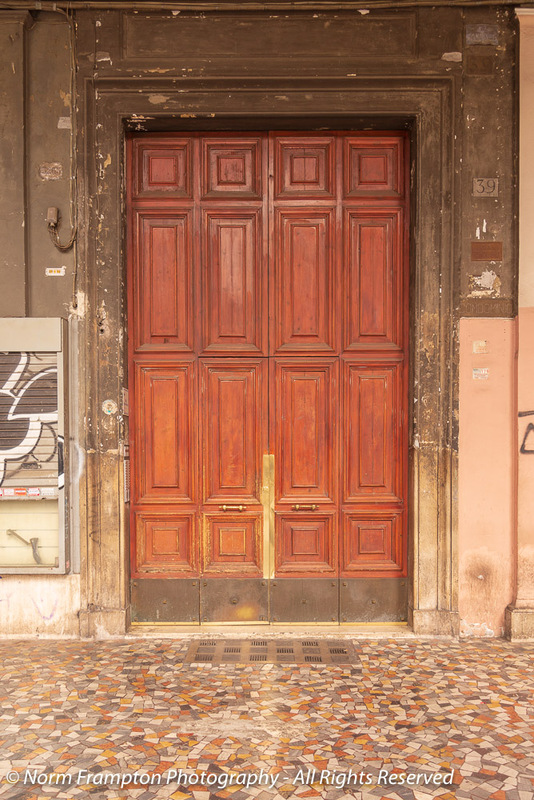 You managed to include a bit of everything here, Norm: wooden doors, doors with graffiti, corner doors, a gorgeous rounded door, busts, etc. 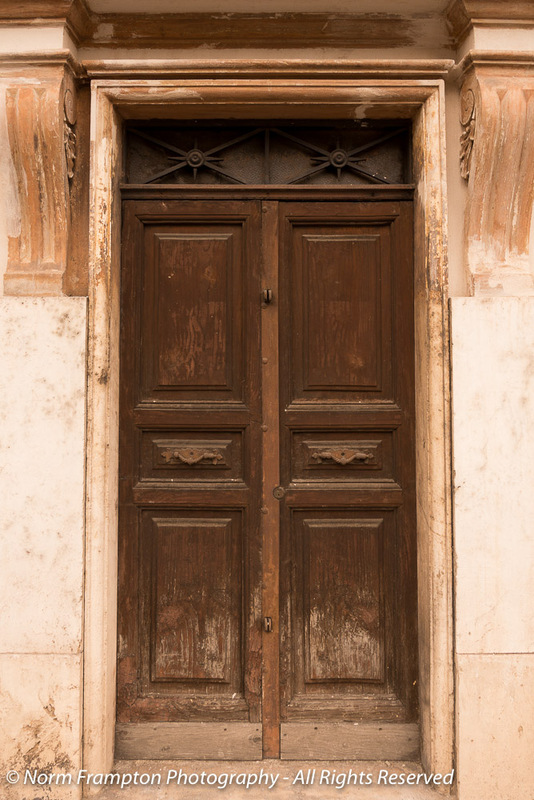 I’m thankful to have found Thursday Doors and all the lovely doorkeepers who participate. The curved door gets full marks for uniqueness!! Based on the first couple of doors, I thought you were going for a door-within-a-door theme. The first one still has my attention. I’m puzzling over the lock on the top left. I can only assume it is locking the transom window … but it looks so odd. On the first one? I’m not sure that’s a lock; I think it might be a security camera..hmm. I’ll have to try zooming in on the original. Ha! Now that I went back to look again with ‘new eyes’, I think you’re right. Too funny, I thought for sure it was a lock, but a camera makes more sense. Absolutely wonderful doors, Norm. I wish I had something to contribute this week, but the doors I saw on Santorini were rather dull. The landscape was much more interesting. I have a door in mind from Crete for next week! With each door I was saying “oooh, this is my fav.” I liked the horizontal hardware (although I want to hang a dish towel on them) and I even like the repairs-in-progress. But the curved corner door wins the prize. That is an amazing door, Norm. A beautiful entrance ringed in stone and a great photo in tight conditions. I hope you weren’t standing in traffic. I know it’s not your holiday but I hope you’re having a great day today. I am thankful for the work you do. Thanks Dan. You’re not alone with the urge to hang dish towels on horizontal hardware – the thought often crosses my mind too. Another lovely collection. 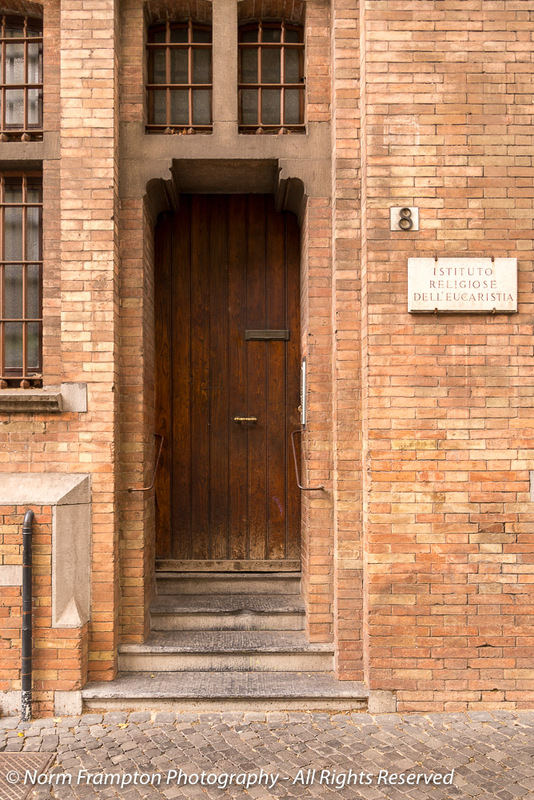 It seems that half the doors in Rome could be candidates for inclusion in Thursday Doors. I saw a LOT of beautiful ones that I didn’t shoot because they were too similar to others I’d already taken. The curvy corner door is interesting!